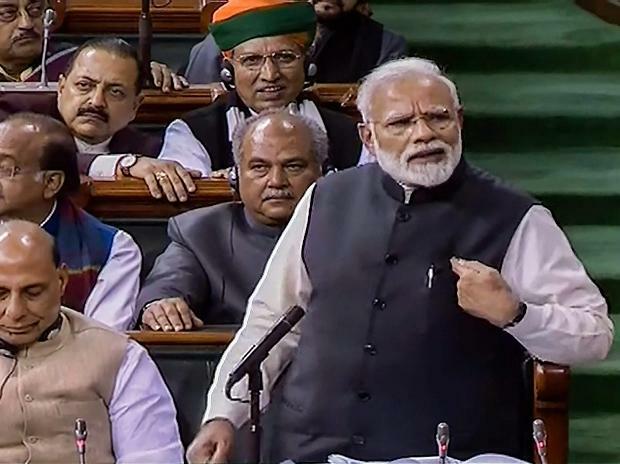 In what is likely to be his last speech in the Lok Sabha’s current term, Prime Minister Narendra Modi on Thursday responded to the recent criticism his government has faced for its purported failure to create jobs. Modi said the people of the country did not want a mahamilawat (greatly adulterated) government. The PM, referring to Congress leader Mallikarjun Kharge’s speech, said for many BC stood for ‘before Congress’ and AD for ‘after dynasty’. He said his efforts at a ‘Congress-mukt Bharat’ were an offering to Mahatma Gandhi in his 150th birth anniversary year — a reference to Gandhi’s wish that the Congress should be disbanded since it had achieved its goal of attaining independence from the British. Modi said his government had provided a clean government and expressed confidence that the people of the country would again repose their faith in his leadership. ALSO READ: Can Kumbh mela help alleviate Uttar Pradesh's unemployment problems? Earlier, Kharge cited reports of a National Sample Survey Organisation (NSSO) survey (which the government later termed a draft report) that said the unemployment rate was 6.1 per cent in 2017-18, the highest in 45 years, to attack the government. Modi termed most surveys that try to capture unemployment rate as skewed since these did not cover the unorganised sector, which accounts for 85-90 per cent of jobs. Citing data, the PM said in the 15 months between September 2017 and November 2018, EPFO had 180 million new members, 64 per cent of whom were 28 years or below. He said the National Pension Scheme (NPS) had 6.5 million members in 2014, which increased to 12 million by October 2018, again evidence of new jobs created. The PM said 635,000 non-corporate taxpayers had added to the list of those who file income tax returns, and these professionals, whether doctors or chartered accountants, provide employment to people. In the informal sector, the PM said transport sector employs the most people. He said in the last four years, 3.6 million new trucks and commercial vehicles have sold, 15 million passenger vehicles and 2.5 million auto-rickshaws have sold. “These need drivers, maintenance…it is unlikely that people would have parked these vehicles somewhere as showpieces,” Modi said. The PM said there had been a 50 per cent increase in the hotel industry, leading to 15 million new jobs, 200,000 common service centres established in villages, and under the Mudra scheme 42.5 million people receiving loans for the first time that has fostered self-employment, which is not covered by any data on jobs. The PM said highways construction, new airports, railway stations modernisation and rural and urban housing have all led to job creation. The PM slammed criticism of the interim Budget’s proposal of Rs 6,000 a year income support to small and marginal farmers, stating how loan waivers never benefit them while the PM-KISAN scheme was targeted at those with small landholdings. The PM said the opposition should ask small farmers if the Rs 6,000 be of any assistance or not. He said the Congress-Janata Dal (Secular) coalition government in Karnataka has waived loans of only 60,000 farmers when its target was 4.3 million, and the story was similar in Rajasthan and Madhya Pradesh. He said the PM-KISAN scheme would deposit Rs 7.5 trillion in bank accounts of farmers in the next 10 years, while the Congress brought its loan waiver of Rs 60,000 crore once in 10 years. The PM listed other achievements of his government, including how demonetisation benefitted. He said the Congress should first look at its record at disrespecting institutions before attacking him on that count. Earlier, Kharge said the present regime was “full of hatred” and it deliberately ignored the contribution of previous governments in building India. He said the government had weakened constitutional bodies, accused Modi of being arrogant and not consulting Cabinet colleagues on key decisions. He criticised the government on joblessness and failing to address agriculture sector. On Rafale fighter jet deal, Kharge demanded a joint parliamentary committee probe, while Modi asked the Congress whether it was derailing the plans to purchase the fighter jets to help some other defence manufacturer. He said the Congress governments ignored the defence needs of India’s armed forces and soldiers. BJP ally Shiv Sena’s Anandra Adsul lamented the “step-motherly” treatment by the senior partner BJP, which has led to questions about its continuance in the alliance. He said the BJP should introspect about its mistakes, and the Sena was happier with the BJP when Atal Bihari Vajpayee, L K Advani and Bal Thackeray were at the helm of affairs. He questioned claims of the government that note ban has benefited the economy. Several other members also participated in the debate.